Dear Dumb Diary - Book 5 - Can Adults Become Human? 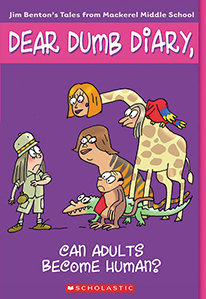 Home > Dear Dumb Diary > Dear Dumb Diary - Book 5 - Can Adults Become Human? My social studies teacher, Mr. VanDoy, never smiles. I know that's hard to believe, because everyone smiles about something, right? Isabella smiles when her brothers get in trouble. Angeline smiles when she thinks about how much prettier she is than, like, a waterfall or a unicorn. I smile when I think about a unicorn kicking Angeline over a waterfall. But Mr. VanDoy doesn't smile at all. I wonder if when you become an adult, you can lose your sence of humor the way you lose your teeth or hair or fashion sence.